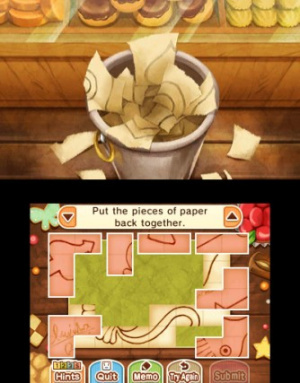 The Professor Layton series was an endearing part of the DS and 3DS generation, spawning six main-series titles and a spin-off with Ace Attorney. After that point Level-5 called it a day on the puzzle solving gentleman, no doubt concerned about the IP losing its freshness and a general decline in sales. It was a sad moment, though, considering how fond many had become not only of the cast of characters, but the entire premise of the IP. 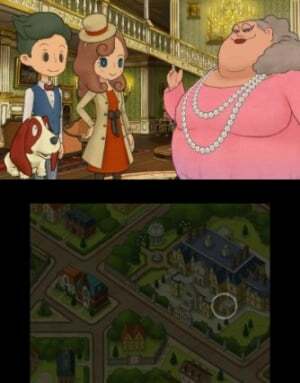 There have been spin-offs and mobile releases since, but now we have Layton's Mystery Journey: Katrielle and the Millionaires' Conspiracy. It arrived on mobile earlier in the year but now finds a home on 3DS, and in various ways it's a series rebirth; for every minor diversion it takes from the original games there are half a dozen familiar features. Level-5 has indeed shaken up the puzzle a little, but the solution remains very familiar. The main puzzle solver extraordinaire this time is Katrielle Layton, apparent daughter of the Professor and the new head of her very own Detective Agency. She's joined by her assistant Ernest - the game is big on names riffing on characteristics - and a talking dog called Sherl with no memory. So yeah, it's quirky. The notable formulaic shift is that the story isn't told through a cohesive linear narrative, but through a number of separate 'cases' to solve. You play through these like you would previous series entries, but the change is that you gradually uncover six clues to 'solve' each case before you then move on to the next. There are some story hooks that hang together through the whole thing, revolving around our sleuths and a group of millionaires (called Dragons, someone at Level-5 has been watching British TV) that are at the core of most of the cases. It's a nice little spin, though unlike the later entries of the main series the diverse nature of tackling the cases doesn't lead to a globetrotting adventure. It all happens in London, or rather a whimsical tea-and-cucumber-sandwiches version of it, with multiple visits to some areas. That's not to say you don't see a variety of settings, but it's all rooted in a very charming and idealistic take on 'old England', where most gentleman and gentlewomen wear hats and sound like the cast of Oliver. Beyond the 'case' structure, those familiar with previous main series entries will feel right at home with the mechanics. You investigate areas with a magnifying glass, tapping on points of interest to find Hint Coins, clues and puzzles. You chat to the locals - which comprises of a relatively small cast all told - to engage in light-hearted conversation, gain leads and, yes, unlock more puzzles. It's all rather delightful, and you'll be pleased to know the Level-5's writers and localisation teams haven't lost their touch; it's a game that raises many smiles through its dialogue and story events. If anything, the formula is too familiar - the idea of solving 'cases' is nice in principle, and you can try and figure each out as you learn more, but the hook is the same as when the Professor solved mysteries. You don't really piece the clues together, they just appear as you play in typical Layton style - the 'detective' angle could have been taken a little further by Level-5, we'd suggest. That said, this game continues to do what it's predecessors did, which is marry appealing storytelling and witty writing with a lot of puzzles. It's always been an enticing combination, and by closely following the lead of its predecessors Layton's Mystery Journey shares the same strengths. There are a staggering number of puzzles to find, and typically a playthrough of a case can leave some undiscovered, encouraging you to go back and track them down. There are more puzzles even than in the originals, with more promised as regular download extras. For the most part they're accomplished efforts, too, though like all games in the series there are a few duds. The majority are excellent, not only for the clever solutions but in the way they encourage you to think outside the box - sometimes the puzzle will throw up red herrings to make you miss a simple solution, leading to the familiar doubts as you submit your answer. There are maybe a few too many puzzles that can be solved through sheer bloody minded persistence rather than deduction, but overall it's an enjoyable collection. Also, and in keeping with the 'back to Plan A' approach here, there are fun little minigames and extras that you gradually unlock in your suitcase. From picking out the right meals for restaurant guests, to basic retail management and helping Sherl 'escape' the dog pound, they're nice little diversions. You can also recap on key points of cases, view extra cutscenes to fill in small gaps in the story, change Katrielle's clothes of even refurbish the office. 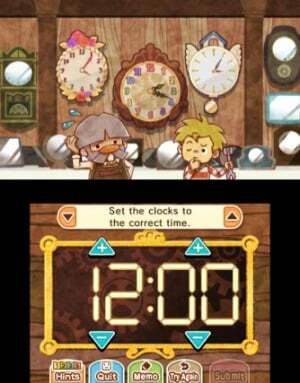 So we have lots of puzzles and whimsical storytelling - with a Layton-esque twist at the end. What's not to like? Well, for one thing, Level-5 took a step back in not bothering to utilise the 3D capability of the top screen. Rather like with another current title - Mario & Luigi: Superstar Saga + Bowser's Minions - this just seems like a cost-cutting or lazy measure. Not a dealbreaker, of course, but it's a shame that a unique selling point of the hardware is being let go late in its lifecycle. Aside from that there's little to complain about here, apart from the aforementioned cautious approach from Level-5. It could have taken the detective work further while retaining the IP's core gameplay, but instead it feels a little tacked on. Because of that, and the more limited scope of the London setting, the story doesn't quite hit the heights of the finest Professor tales, even in his earliest days exploring a mysterious village. It's still all jolly nice, however, and the new cast are easy to like; there's potential for a series rebirth to live beyond this entry. Layton's Mystery Journey: Katrielle and the Millionaire's Conspiracy feels rather comforting, the video game equivalent of a warm blanket. For the most part it reverts to the core formula of the Professor Layton games, albeit with a new cast and by dividing the narrative into mostly lighthearted, charming 'cases'. All it lacks is the confidence to fully embrace its new setting, stopping short of expanding upon some of its ideas. That said, it still delivers the series' unique blend of storytelling and lots of puzzles with aplomb. It'll have fans and newcomers scratching their heads and smiling at the same time; here's hoping it's not Layton's final mystery. 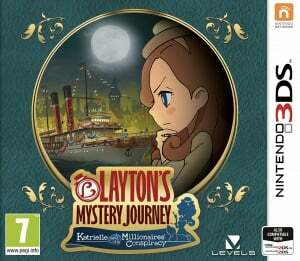 As a big Layton fan, I'm really looking forward to picking this up tomorrow. Weekend's not long enough to play all those new games AND participate in the Splatfest. I was disappointed with the huge drop in puzzle quality and the somewhat unmemorable characters. Usually, I only like to wish for one video game every Christmas. This year, I might make an exception for this, and Samus Returns. This is probably the one game I wish the most was on the Switch instead (even more than Metroid, yeah), since my 3DS has a busted circle pad that I won't bother to fix for now. There's talk of a new Layton entry next year, though, so let's hope. Need to buy this for my wife. She has been going through Layton withdrawls. Time to put down that crochet hook and pick up a stylus! I'm so ready for another Layton fix. This has been my favorite game series from the moment I loaded up the very first game and I can hardly believe it's been ten years since Curious Village came out (well, nine since I got the chance to play it in America). 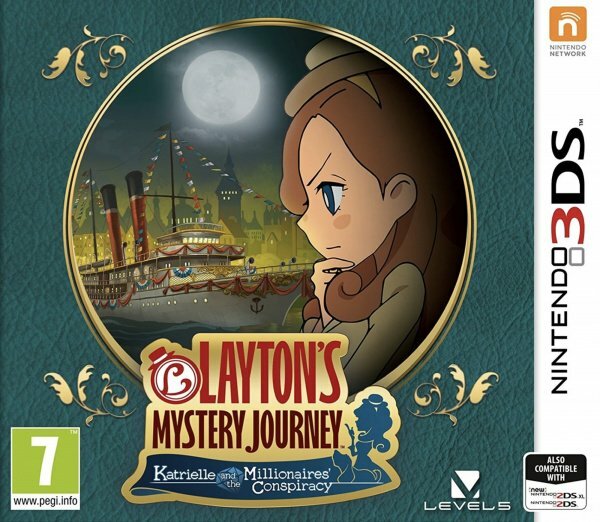 Haven't played Layton 6 yet but I've already pre-ordered this one, £26 with Amazon Prime - keep the Layton games coming Level 5. With the rather cliché way of getting rid of Layton, and the general decline of Level-5, I'm not sure if I'll bother. 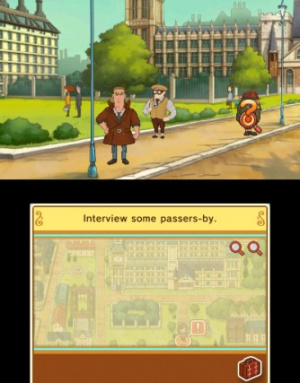 I'm a huge Layton fan, but I really don't know what the point in this game is. No 3D. DLC galore. Remind me why this is a full priced retail game when it's less than half the price on mobile devices? This sounds like such a step backwards for what used to be a series that would only improve with each new instalment. I remember waking up before anyone else in the house so I could sit in the living room armchair and keep playing The Curious Village. Loved the series then and still do. It's a good one to have grown up with. Given the lack of 3D and the general uselessness of a second screen during gameplay, I sure wish this game had come out on the Switch. Portable mode would obviously work fine, and I can't imagine any puzzle being complicated that it couldn't also use traditional or motion controls for TV play. All Layton games are comforting, good for rainy days indoor, just like Enid Bryton books. meh, just give us a true sequel of Unwound Future. I would have paid the full price for the 3d. I tried Last Specter but I didn’t enjoy it, so I’ll be skipping this one. @LegendOfPokemon The Last Specter was, in my opinion, the weakest entry in the series, though still enjoyable to me. The series isn’t everyone’s cup of tea though, so I get it. As for me, I’m stoked to have more Layton adventures, even if it’s not the gentleman himself. Just wish they would have implemented that 3D feature into this, as with Miracle Mask and The Azran Legacy it added a lot of visual depth to the proceedings. One could chalk it up with it being on mobile phones as well, but that’s a lazy excuse at best. Here’s hopeing we get a sequel on Switch next. I'll buy it, though its shameful that they ask the full 40 Euro for it (I heard it costs only 17,50 Euro on ios). The quality of this game will be for me the deciding factor wether I'll buy future instalments or not. And dlc, yuck! Should have been free with this super-expensive version! I've still never played a Layton game. Funny enough, I actually own The Miracle Mask which I got on a clearance rack for $5. It was an impulse purchase and I never got around to playing it. I plan on playing through that soon then jumping into this entry as it looks like a fresh start that anyone can enjoy just with some lore for series veterans. @Varoennauraa Agreed. It's a shame so many recent 3DS titles are omitting the 3D aspect. @ralizah I know the original puzzle creator passed away last year. That might have something to do with it. I'm not sure though, I'm only half-way through The Curious Village. So, it's a standard price 3DS game (£35, with deals available down to about £28) with no 3D and with a stack of day 1 DLC? I cancelled my order, not impressed. So isn’t this game the same as the app so got same story and puzzles? So no point since I got the app. I'm excited for this one. Should be able to play lots of it this weekend. Edit: Seeing all that Day 1 Paid DLC for this is killing my hype. The 3DS version is seeming more and more like a ripoff now. The game is being sold at a full retail price, has paid DLC, is vastly more expensive than the mobile version, and they didn't even bother to add 3D to it. I'm very tempted just to return my preorder and instead buy the mobile version. @RamrodDestroyer I'm sure it has everything to do with it. The job of designing the series' puzzles went from a veteran puzzle designer to a relative newbie. I love Professor Layton so I'll get this soon. Shame there's no 3D as it was very well done in Miracle Mask and Azran Legacy, and I don't understand why there's so much paid DLC, but I'm still looking forward to playing the game. Am I correct in saying that this is the first Layton game to have DLC that isn’t free? Now that I've calmed down from that Day 1 DLC news, I'll probably keep my preorder and enjoy this. However, I'll be more careful next time I want to get a Level 5 game, and won't preorder their games any more. Yeah I'm good on this. Luke and Layton were the entire foundation of the series. Why this weird spin-off to just be "different" but, try to do the same thing? Makes so sense to me. I know the puzzle master died from the original games but, either keep Layton and Luke alive or move on to something completely different. 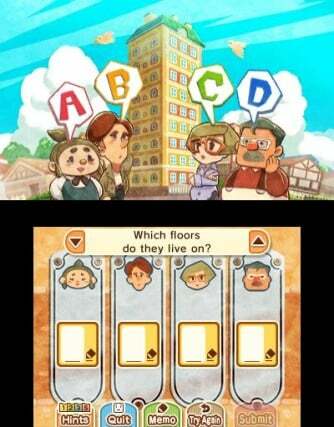 You can keep this wannabe Layton poser game. I don't care who made it either. No Layton, no money from me. @Cooligan Definitely play the other games first. They are the real series and this is just a wannabe. The DS games are phenomenal. Especially The Curious Village and The Last Specter. @crimsontadpoles Yeah get used to it. Level-5's joining the you don't get our full game for full price crew. You have too overpay just to get all the basics. @Oat Layton is so good that this trash just deflates the whole series. @MisterKorman Yup. And it's day one. And you have to overpay for the full game. @crimsontadpoles It is a ripoff and the games trash compared to the rest of the series. @Henmii Yeah its a ripoff and nowhere near as good as the real series. @Oat It's a toss up between The Curious Village and The Last Specter. The Diabolical Box is close behind those and then Unwound Future. The Mirror Mask is really not as good in my opinion. It's still good but the puzzles aren't quite as tricky. The Azran Legacy is okay but probably my least favorite. The Phoenix Wright spinoff was okay but I don't like Phoenix as much as Layton so I only played it once. What's yours? I'm not sure if I should grab this on the 3DS or if I should get it on mobile when I upgrade my phone. Either way, I'll be waiting to pick up this one; I have too many other games to play right now. @fafonio : I don't know whether this has daily puzzles like previous games, but it has quite a bit of paid day 1 DLC. @fafonio : The eShop updates for the week details all of the currently available DLC. I have it in my possesion, so I'll find out soon. To be honest I suspect a lesser game, since its probably ios quality. 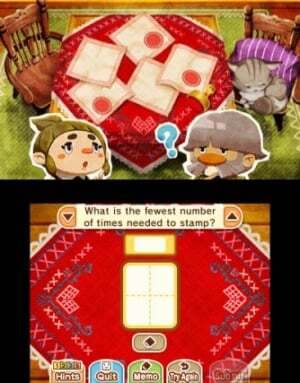 @LiberatedAnimal I knew they were charging more for the 3DS version, but this was news to me. How disappointing. I hope the game is good enough to make me want to buy DLC, otherwise I won’t. @Sir_Anthony It makes the impression of being that way because the 3DS version was more of an afterthought who just needed a port of the cellular version. @fafonio You'll still get a full year's worth of daily puzzles for free. The Day One DLC consists of a half-dozen additional outfits for Katrielle (each of which comes with one bonus puzzle, like the outfits you unlock for free during the game). Each outfit is like $2, or you can get a small discount if you buy them in a bundle. So it's expensive, but hardly a huge amount. Well, this review sounds interesting, thanks for it. It is a shame that most of the descriptions refers to previous games. For those who is first time, is not very informative.